If you want a stylish round dining table, but think the Tulip table has been done to death, you might want to save up a little more and go for the Platner Round dining table. 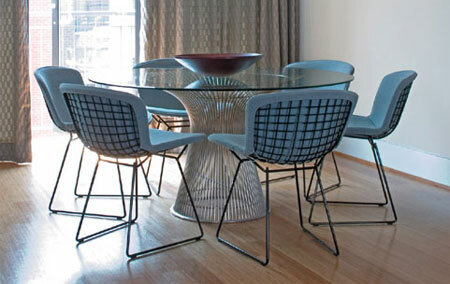 Originally designed by Warren Platner back in 1966 but still available via Knoll, the dining table features a vertical steel rod frame in nickel or bronze finish, with a bevel-edged glass top to finish things off. Prices start at £1,680 – and the matching chairs are obviously extra. If that’s a bit much, smaller versions are available as coffee and side tables.